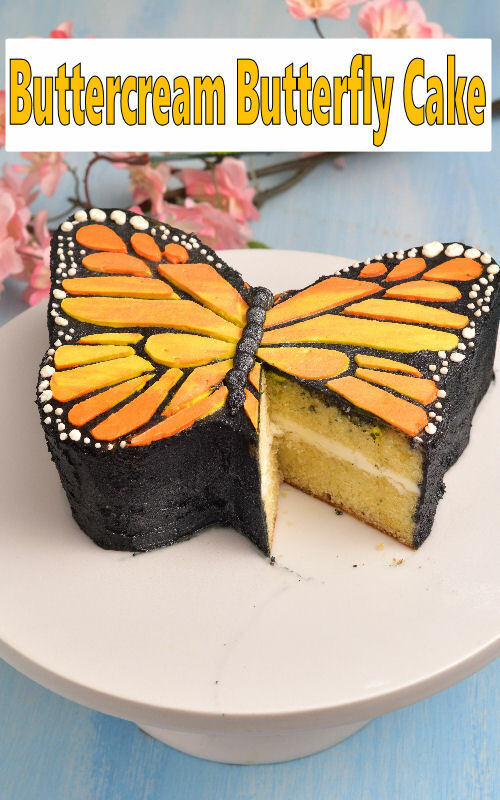 Making a beautiful Butterfly Cake doesn’t have to be complicated. 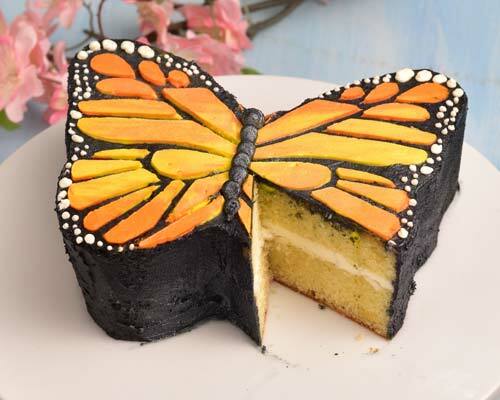 Use my easy decorating technique and create a stunning birthday butterfly cake in a jiff. First I baked 2 – 6 inch cakes. If you need to make a larger cake you definitely can. 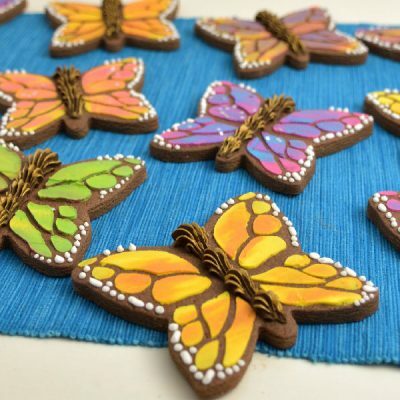 To make a larger butterfly cake you’ll need to bake larger rounds. And also remember to adjust the size of the template accordingly. I used Velvet Vanilla Pound Cake but you can pretty much bake any cake you’d like. If using a sponge cake I would recommend that you freeze the cake before you carve it. Start by torting 2 cakes. Then cut them in half. You should have 2 cake layers on each side. To keep cake moist I also used Simple Sugar Syrup. Brush it or squirt the syrup onto the cake layers using a small bottle. Fill the cake with Swiss Buttercream. Right after you fill the cake you can crumb coat it. Then chill the cake until firm, about an hour or so. With a serrated knife carve the cake, using a template. 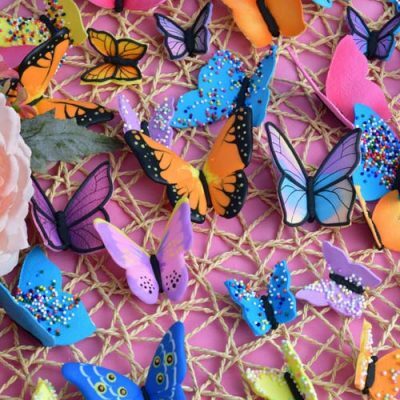 Place each wing onto a cake board or a plate, use some buttercream to glue the cakes in the middle. Ice the cake with black buttercream or ganache, chill until firm, for an hour. Make sure the top is smooth, use a long spatula to smooth the top. 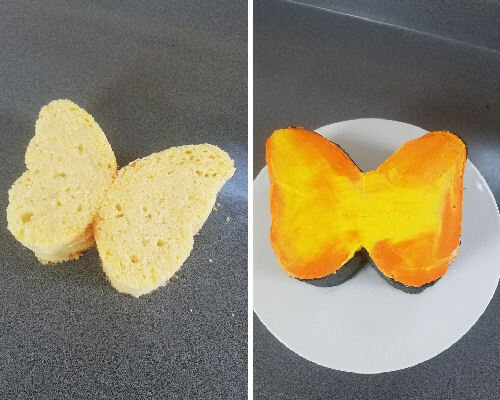 Color Swiss buttercream with orange and yellow food coloring. How do I color Swiss Buttercream, my gel food colors are not working? 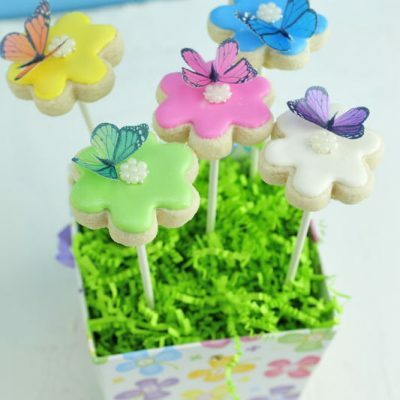 – learn a quick tip on how to effectively color Swiss Buttercream with gel food colors. Have a butterfly wing stencil ready. I used a card stock paper to make the stencil. But if you plan on using it again I’d suggest using stencil blanks to make the stencil. Stencil material is more durable and will last you many uses. Use an exacto knife to cut it out. When stenciling, work on one side of the cake at a time. Place a stencil on a well chilled cake and pipe yellow and orange buttercream onto the stencil, just as you see me doing in the video. Use a spatula and spread the buttercream over the stencil. In one direction. Start from the center and move the spatula towards the outer edge. Carefully lift up the stencil. Wipe it clean and repeat on the other side. 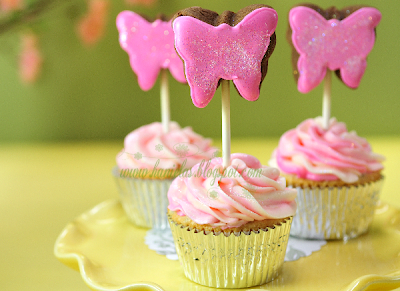 With black buttercream or dark chocolate ganache pipe the the butterfly body with a round piping tip #12. 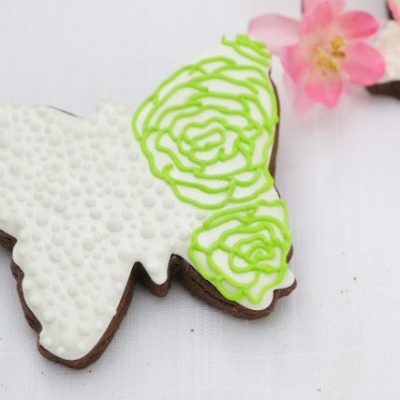 Use white buttercream to add spots onto the wings. Sugar Syrup : bring equal amount of sugar and water to boil, simmer for 5 minutes. Remove from the heat. Let cool. Flavor with vanilla extract or other extract. Use to keep the cake layers moist. Template – this is a half wing template, you can adjust the size based on the size of your cake. Hello may i please have the template for this cake? Hi Hani, Can I please also get a template for the cake. 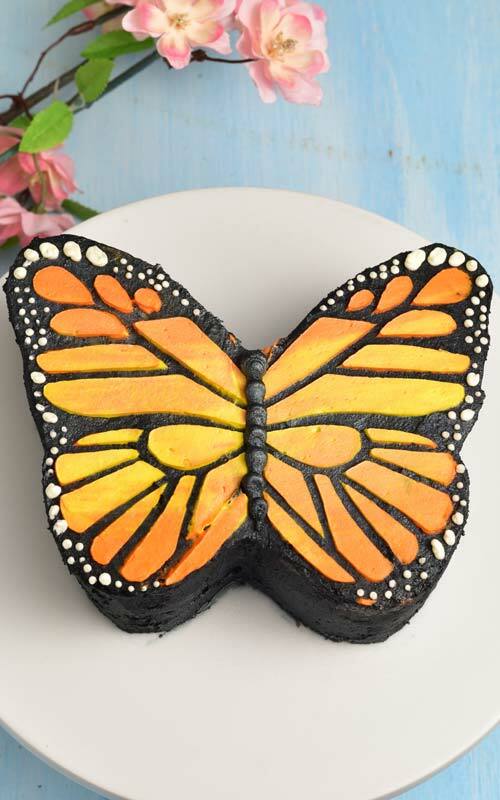 Am making this next week for my 8yo Monarch obsessed daughter. Thank you! Such a beautiful cake! 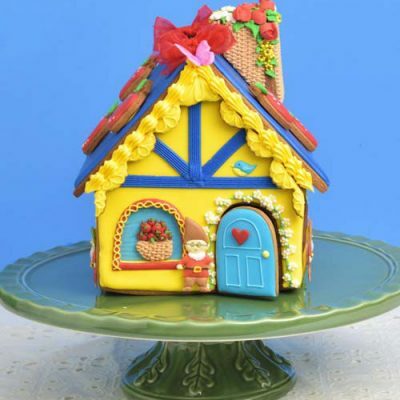 I’m planning to make this tomorrow for my daughter’s birthday. When I click on the stencil to print it, only the cookie stencil comes up. How can I get to the correct template? Any help would be appreciated. Thanks much! Just sent you an email with the template. Thanks for letting me know about the issue. Thank you for the tutorial. How would I make this bigger? Thank you for the ideas. I used a 6 inch cake but it’s definitely applicable for a large cake, too. What are you having issues with? Yes I am keen on your. Balking.sweets.and.cake. .